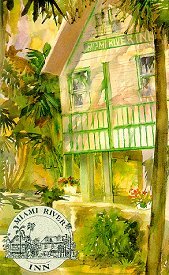 Originally constructed between 1906 and 1910, the Miami River Inn boasts four wooden cottages surrounding a pool and jacuzzi in a lush tropical garden. In 1988, Sallye Jude, a local preservationist and community activist, began renovations on the Inn and turned an aging collection of old Miami into a beautiful hideaway now part of the National Register of Historic Places. 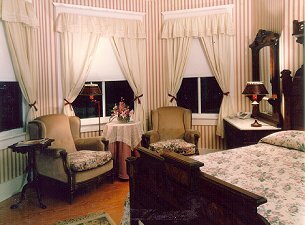 The Inn consists of forty rooms, each individually decorated with antique furnishings hand picked by Mrs.Jude. Rooms feature cable television, touch tone phones, central air and heat, and private bathrooms. The Inn sits across the Miami River from downtown Miami in the ethnically diverse Miami River Neighborhood of East Little Havana. The Inn is only a few blocks from downtown area shopping, dining, museums, and galleries. The beaches, airport, Port of Miami, and Orange Bowl are all within a 15 minute drive. Furnished apartments and conference facilities are also available. This and other Miami Bed and Breakfast Inns can be found here in The Register. Romantic Country Inns, Getaways and B&Bs offer a great Miami lodging alternative to big hotels.